When was the last time you’ve watched Nicolas Cage in a great film? You definitely can’t think of a film right? Here comes “Knowing”, a flick marketed as a mystery film with a scary twist and showing mounds of potential in its trailer. Could this be a film that will help the once well-respected and Academy Award winning actor Nicolas Cage come out from his string of unsuccessful movies (after unsuccessful movie) or will it be another one of his so-so films, far from the “Face-Off” or “Con Air”? Fifty years ago, an elementary school class buried a time capsule with drawings of what they think the future will be like. One girl though, Lucinda, did not draw numbers but actually wrote a gibberish of numbers. Fast forward to present time, the time capsule is dug up and each student was given a drawing. John Koestler’s (Nicolas Cage) son receives a curious piece of paper, full of nothing but numbers (what Lucinda wrote). John Koestler (by chance) soon discovers the meaning behind these series of numbers - each telling a date of a major tragedy or disaster, the number of casualties and the longitude and latitude location of the place where it happened or about to happen. Now, it is up to John to prevent the three disasters that are yet to happen. One thing we’d like to ask is: what is happening with Nicolas Cage? He can’t seem to get a good movie despite his numerous projects left and right. 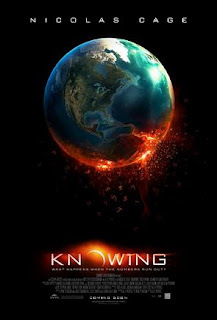 “Knowing” showed a lot of potential for about three-fourths of the film but it closed with a disastrous, just-plain-weird ending. You know, just when in basketball, from first to third quarter, both teams play tight when suddenly one team loses steam and gets pounded in the last quarter. It could have been a good film honestly, if it just ended minutes before the bad ending happened. Were the writers “high”when they finished up the plot? But anyway, looking back, some parts of the film like the “weird” people could have led to the bad ending, so from the start it was doomed to fail. However, the film’s saving grace is some notable scenes like the plane crash and the train disaster. These scenes reminded us a lot of “Final Destination”, these scenes might even be better as they showcased not only nice, realistic graphics but also the raw human emotions that come with it! These scenes is where Nicolas Cage probably did shine. However, what we really hate are bad endings that just take you aback, by a lot. For that, we won’t encourage you to spend your money on this one. - - If you are a fan of Nicolas Cage: we can say this film is better than his lame attempt as the Ghost Rider and being an assassin sent to Bangkok!